What the heck is ‘chicken base’, anyway? Travis and I took the advice of some of our friends with little ones and went to visit ‘Let’s Dish’. This is a store where you can go and pre-assemble a bunch of nice dinners to go in your freezer at home, for later cooking and eating. It seemed a bit pricey at first, but one ‘dinner’ feeds 6 people and there were several ingredients used that we don’t have laying around our home (large bunches of fresh parsely, tahini paste, pork tenderloins etc). We’re looking forward to trying these out when TinyD gets here and we don’t feel like cooking, going out, or trying to subsist on ramen noodles and mac & cheese. 2. Some sort of material, that if you run an electrical current through it, a whole live chicken appears. Yesterday was GlenMar Young Adult Small Group Field Day 2007. Many thanks to the organziers for a great day! We had Olympic theme music, a torch lighting ceremony, and ribbons for the teams (1st-3rd, Field Day Participant, and Mom-To-Be). The events included Tiki Thunder Hockey, the discus throw, dizzy basketball, a 3-legged race, potato sack race, water balloon toss, among others. 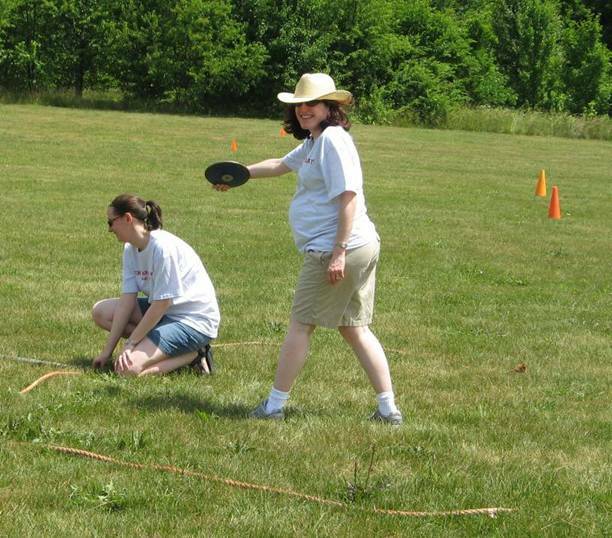 Here’s a picture of me throwing the discus (with Gen measuring), which unfortunately did nothing for convincing Genghis to arrive. Everyone Needs Some Polka-Dot Pants! Seth has been after me for weeks to start doing the profile pictures. (Which is very ironic because he runs away screaming if anyone tries to take a picture of him.) So we finally took one a while ago– I think this is at about 10 weeks. This post isn’t about preggers pictures, though. It’s about polka-dot pants. As you can see from my glamour shot, I am wearing some really fun pantaloons. I got these pajama pants for my birthday in either my sophomore or junior year at Baylor so they’re at least 7 years old. Here’s the crazy thing, though– I didn’t just get ONE pair of these pants for my birthday, I got TWO! Yes, both Anne and Fran saw fit to bestow these Old Navy orangey pink wonders on me. While I’m honestly not sure what happened to the other pair over the years, I have never before been so certain that I was supposed to own a particular item of clothing. So while I may not be able to wear them through all the preggers profile pics, there was no way I couldn’t start the process in my ultimate polka-dot pants! I’m wearing them even now as I type this entry!